Searching for kitchen cabinets in Melbourne, FL? Design, fit, and function matter. 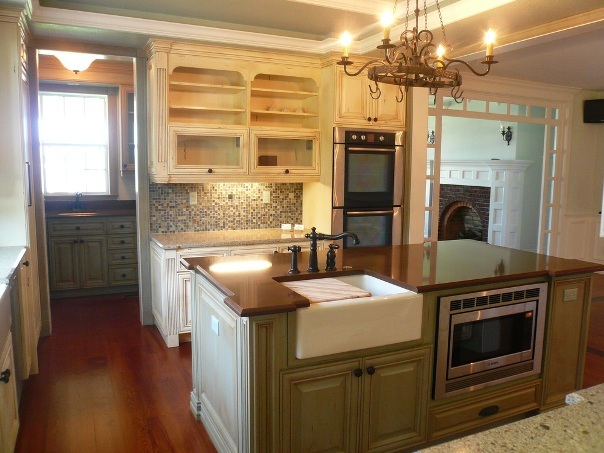 We've been designing and building high quality kitchen cabinets in Melbourne, FL for over 30 years. No more looking through catalogs; tell us what you want and we'll build it for you... at a factory direct price. Call us at (321) 636-1101 to discuss your project. The Cabinet Designs team has a real soft spot for the Melbourne area. We love designing and building custom cabinets everywhere in Brevard County and all over Central Florida, but there's something unique about Melbourne. Our soft spot for Melbourne goes way back. As a child growing up in the Melbourne area, our very own Scott Riley (who is a Melbourne High School graduate) has many fond memories. Whether it was fishing with his dad in the Indian River Lagoon, strolling the Downtown Melbourne streets with friends, or grabbing a cone at Del’s Freez, Melbourne is home. We've always loved the diversity of kitchen remodel projects that Melbourne area residents dream up and ask us to bring to life. One project might take us to Lake Washington or West Melbourne or even Eau Gallie. And the next week we’re building cabinets for a client in the Suntree or Viera area. We have completed hundreds of jobs there since 1984. Not only have we worked with residents on kitchen renovation projects, but we’ve built bathroom cabinets, bookcases, bars, outdoor kitchens, home offices, closets, and more. Most of all, Melbourne locals are really fun to work for. We consider cabinet making an art form - one that demands painstaking attention to detail. We like that the residents in this part of Brevard County always seem to feel the same way and appreciate quality and craftsmanship. Thanks for checking us out. We'd love to discuss your current project with you and see if we'd be a good fit. Or you’re welcome to just stop by anytime. We believe that when it comes to cabinetry: design, quality, and functionality does matter. You can check out our portfolio of kitchens here. And see how we build our cabinetry; of which every component is build right here locally in our Rockledge factory.